Sod is mature turfgrass that has been grown and harvested at a sod farm and cut into square pieces that include the grass, roots and topsoil. Any turfgrass that can be grown from seed can also be grown and harvested as sod; however, different types of grass are more popular as sod than others. Although more expensive than grass seed, sod grass provides an instantly green lawn free of weeds and disease. Buffalo grass is a warm season, perennial lawn grass native to the central plains. This grass is resistant to drought and disease but a poor choice for high-use areas. 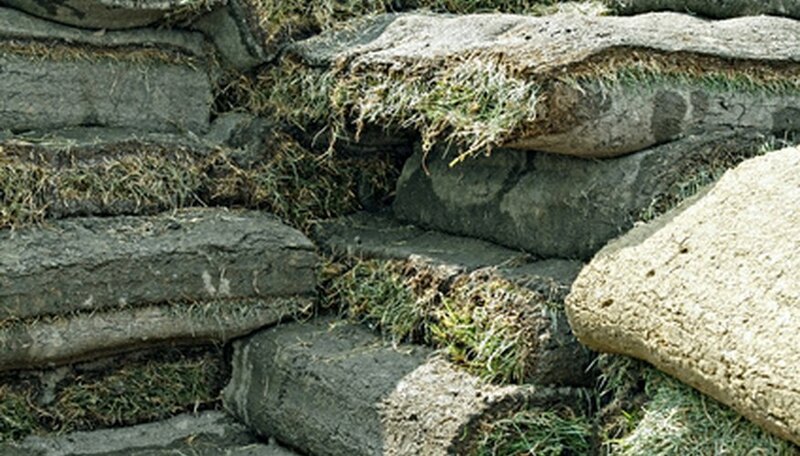 Buffalo grass sod should be no less than 2 square inches and should be planted on a moist, clean, level seedbed. St. Augustine grass is a warm season lawn grass found in the southeastern United States. Preferring moist, sunny lawn areas, St. Augustine grass requires moderate maintenance and does not support heavy usage. St. Augustine sod grass is easily established due rapid root growth and propagation through creeping stolons. Zoysia grass is a warm season grass found in south-central and Gulf Coast regions of the United States. Drought, wear, and shade tolerant, Zoysia sod grass requires little maintenance once established. Kentucky Blue grass is a popularly grown warm season grass on the east coast and provides a dense, green turfgrass that is highly tolerant to foot traffic. Kentucky Blue grass sod is commonly sold as a blend of different varieties of Blue Grass or mixed with Tall Fescue grass. Centipede grass is a slow-growing, low-maintenance, warm season lawn grass grown in coastal regions of the eastern seaboard. Due to its slow growth from seed, Centipede sod grass is a attractive alternative for homeowners who do not want to wait an entire growing season for their new lawn to mature.